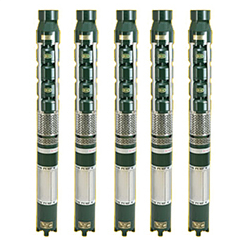 A submersible pumps as the name suggests are used submerged inside the water & liquids and basically have an ideal mechanism of motor with 100% water-proof sealing fixed to the pump body. Our Single Phase Submersible pump set is highly chosen because it offers superior and efficient performance with least operating expenses. It has high resistance to corrosion and abrasion. The ideal design & make averts the waterback flow & hammer towards the pump. It also provides safe-guarded impellers as well as diffusers. The maintenance of this pump is very easy just like its simple installation. Our single phase submersible pumps are meticulously made in adherence to the industrial standards by making use of the most contemporary technology & advanced hydraulics in addition to utilization of high grade materials & components. We very austerely test out the quality of our products at different parameters to offer flawless performance products to the clients. Our pumps are very reasonably priced.